My love for the sun-drenched, wide open, arid landscape of New Mexico began in my early childhood. I was five when my dad accepted a job as Head Football Coach for Western New Mexico University and my family moved to Silver City in southern New Mexico. From my perspective, everything was an exciting new experience and I was with my family, so I didn't really have any higher expectations. I had my books, my Star Wars and Strawberry Shortcake toys, so life was good. I didn't understand the impression this land would leave on my spirit, and how it would shape me into an artist until much later in my life. My mom, dad, younger brother and dachshund,"Fumbles," arrived in New Mexico with an open heart to a part of the country that was far away from our Midwestern roots in Indiana. With just a few neighbors dotted along the long dirt road to our house, the rural life that accompanied our new home contrasted greatly with the suburban life I had experienced when we lived in Indiana and Michigan . A vast, yucca speckled desert set against a backdrop of distant purple mountains was my new backyard. Countless hours were spent wandering and exploring with my two new neighborhood friends. We learned independence and experienced freedom in the open landscape. We spotted wild critters, enjoyed watching the local farm animals, and discovered abandoned artifacts which we'd take home with us. I developed a lifelong fascination with collecting pebbles, shells, bones and natural artifacts from my travels. Idle indoor hours were spent drawing, reading and creating projects for myself. After school, I would often accompany my parents to work and began to entertain myself with countless hours of drawing. I read every book I could get my hands on and even organized my book collection into a lending library, complete with check out cards and a Dewey Decimal System (my little brother was my only patron!) I began to write letters, create cards and sign the back "Erin Fickert Products" or "Erin Publications and Cards" with a yucca symbol. When my grandparents would visit, they would take us horseback riding, and I felt like a cowgirl on the open range. I loved the blue skies, fresh air, distant horizons of New Mexico, and time with my grandparents. It was in New Mexico that I first experienced climbing up mountains, hiking down into caverns, and dipping my toes into rushing rivers. I discovered rich flavors of green chile infused foods and the pleasant scent of burning piñon firewood. I still enjoy each one of these splendid experiences in my life today. During this time, I also developed a love for Native American culture, art and prehistoric architecture. I attended public school, where my mother taught physical education, for first, second and third grade. Here, I made a wonderfully diverse group of friends, and began to learn about the beautiful art and mythology of Native Americans. As students, we made totem poles, pictographs, and sand art in school. My family began to collect Hopi Katsina figures and Native American pottery. Exposure to these art forms at an early age must have created little seeds that settled into my soul, but they wouldn't germinate until I began to pursue art seriously many years later. My family moved to Texas when I was 8, after I completed third grade, and I didn't return to New Mexico until I was 21, during my sophomore year of college. 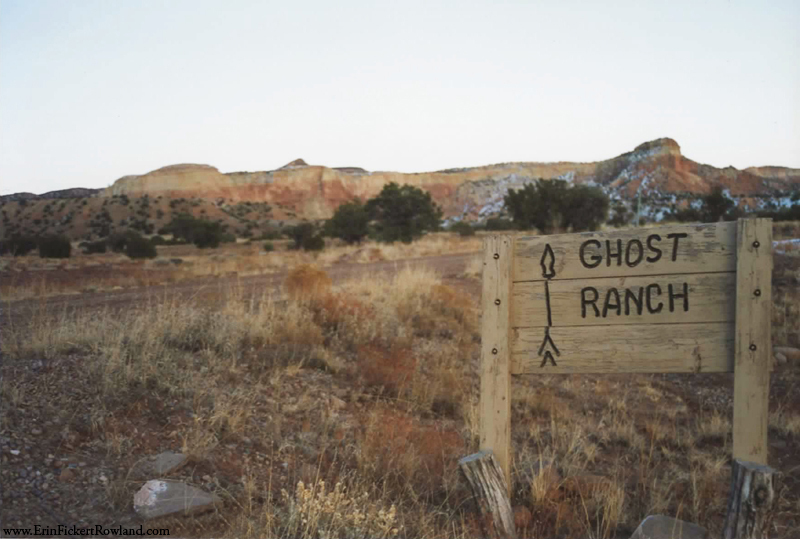 While studying art at DePauw University in Indiana, I had the opportunity to spend several weeks studying ceramics at Ghost Ranch in Abiquiu. Once again in the stark environment that contrasts with flat desert and looming mesas, the landscape of northern New Mexico immediately resonated with me. There is a peace that settles over you when you are immersed in these sparse surroundings. You are forced to find a satisfaction with your own soul. There are very few pretenses that you or those around you can put on, so you connect with the land and with others in a spirit of authenticity. The ruins of Bandelier National Monument had a tremendous impact on me when I first saw them and began to understand how ancient people lived in community with each other and survived off the land. Connecting with an ancient artist by viewing authentic petroglyphs is an inspiring experience. Art, music and architecture were all integral to the daily lives of the Ancestral Pueblo people, and the materials they used for these art forms were provided by the land itself. I never had the opportunity to visit Santa Fe when I was a child, and I fell in love with the city on the one afternoon I had the chance to spend there. A rich history of art, culture, and delicious food all contribute to a wonderful experience when visiting this city. I marveled at the glistening bronze sculptures, the Native Americans selling their arts and crafts at the Palace of the Governors, and the exquisite rounded corners and timber beams of the adobe buildings. I am currently in the production stages of creating a new body of artwork that will reflect my love for the landscape and culture of New Mexico. Pencil drawings and color studies are being composed and created to prepare for my new series of oil paintings. I have been working in graphite to arrage strong compositions and values, and also in watercolor, soft pastel and oil pastel to discover color nuances and mark-making techniques that will effectively create successful oil paintings. The New Mexico series will portray the landscape of Santa Fe, Bandelier National Monument, Taos Pueblo and the New Mexican countryside, and will explore some of the significant cultural and religious practices that define the spirit of New Mexico.